Now that C has turned 3, she has shown a lot of interest in beginning to learn more letters, sounds, writing, counting and typical “preschool” skills. To celebrate that we are doing more projects together, totally lead by her interests, and in a 100% playful way! 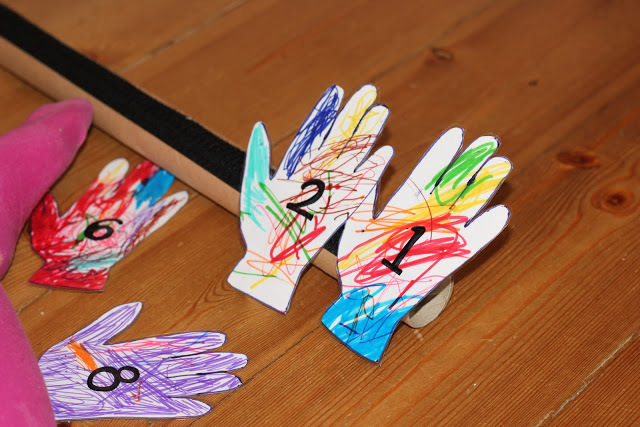 I have two new series starting on the blog called Playful Maths and Playful Literacy, which will appear alongside our usual foray into finger painting, goop and sensory tubs. I hope you will enjoy them. 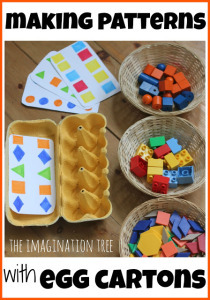 Here is our first Playful Maths fun time! C has recently become really interested in measuring things, due to all the midwife appointments I’ve been having and witnessing my tummy being measured with a tape each time! 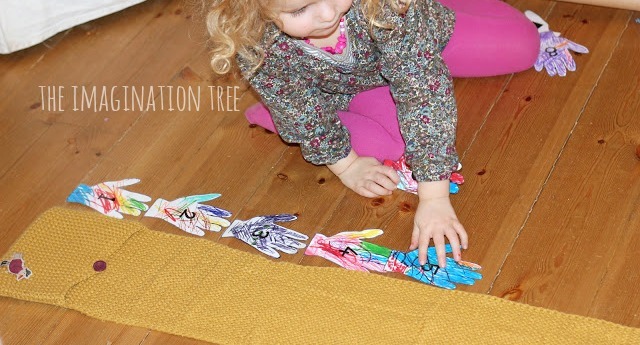 So we had a bit of fun creating and playing with our own unit for measurement- her hands! 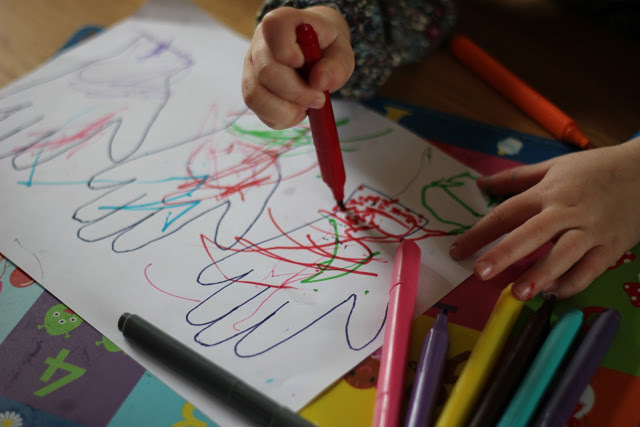 I drew around one of her hands and then used that to draw another 9 handprints onto paper. 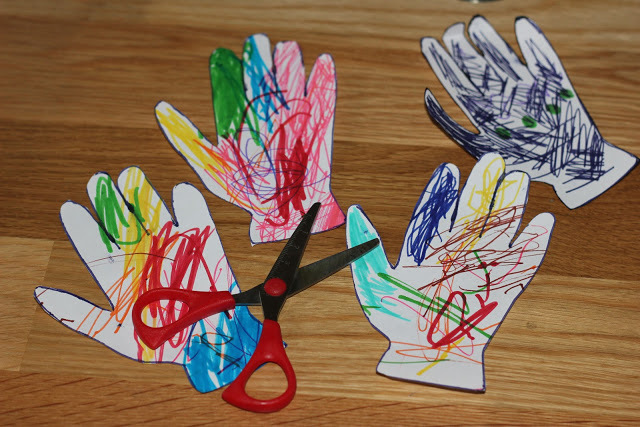 It was important to use the initial hand outline so that each hand was exactly the same size and shape. Then she decorated and coloured them (over the period of a day or two!) and I cut them out again. I wrote a number from 1 to 10 on each hand and then laminated them. On the back I stuck some velcro sticky tape (one of my favourite ever craft/ activity products from teaching days!) and then found one of our many wrapping paper cardboard rolls left over from Christmas! Onto that roll I stuck a long strip of the velcro tape, ready to stick the hands onto. We shuffled up the laminated, numbered cards and C sorted them all out, naming all the numbers and then sticking them onto the number line tube in the correct order. She chose to start at the right and work backwards, naming each one as she placed it on. She was very pleased with herself when she finished it and wanted to take them all off and start all over again, immediately! Then we found some items from around the house to measure, by laying the hand prints down next to them, top to bottom. 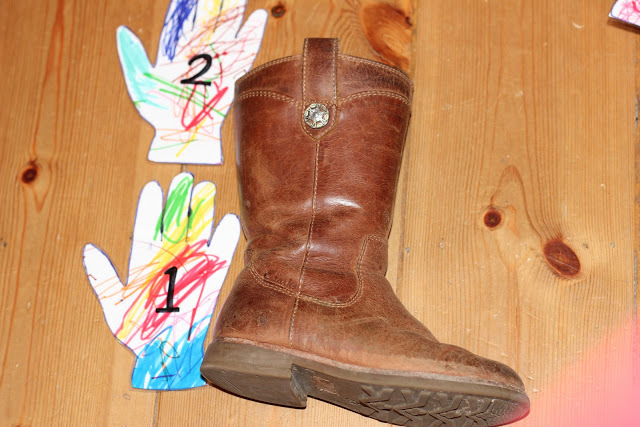 She chose her boot first and that turned out to be the tricky measurement of 1 and a half hands, which was a great discussion point, but hard to understand! 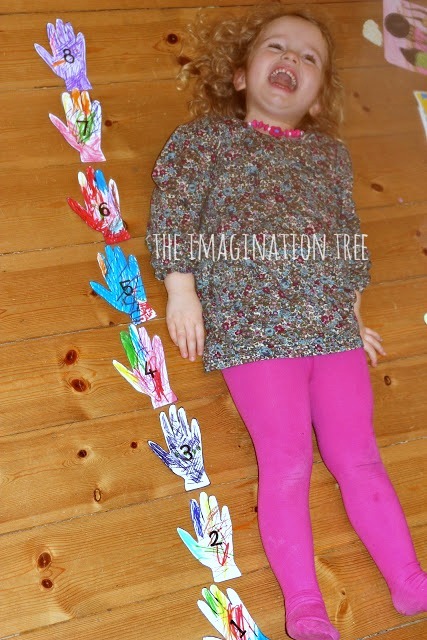 Then we laid out her scarf and she carefully placed the hands along it, to discover it was exactly 10 hands long…so MUCH longer than the boot! Great for comparing sizes and lengths and concluding which is biggest/ smallest. But most fun of all was to measure C herself! She turned out, rather surprisingly, to be only 8 hands long, so shorter than the scarf! Who would have guessed it?! 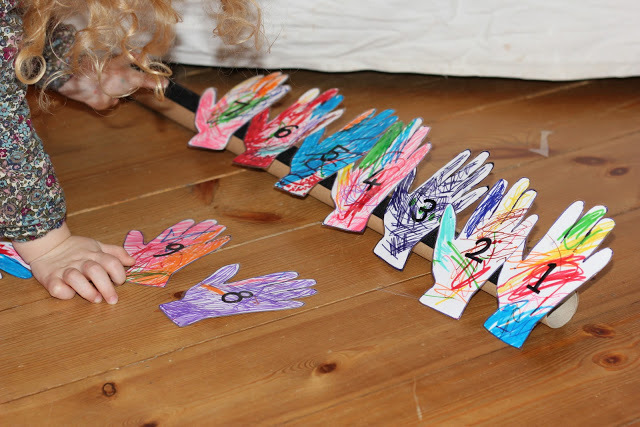 There are plenty more opportunities for playful fun and learning with these numbered hands! What else would you do? See the rest of our Playful Maths archives here for more ideas. My girls are roughly the same age (13 mths apart) and we love your activities. However I find it very hard to do more learning based play with my older (nearly 3 yr old) child as her younger sister wants to do EVERYTHING her big sister does, but obviously some tasks are beyond her, so the game ends in frustration and tears and lots of fights and grabbing stuff! How do you manage?? We will try the above activity with both their handprints and see how we go! I replied below (before this funky new method of replying suddenly appeared!) Hope you can see it! 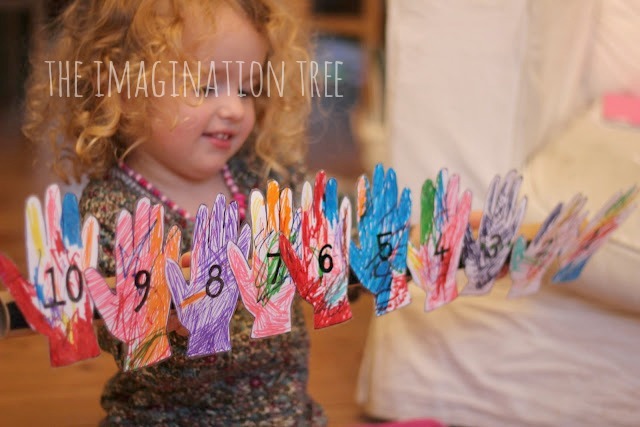 Love this idea, my eldest is 3 and a half and really into wanting to find out more about numbers and letters. She’ll love this activity. Can’t wait to see some of your playful literacy ideas too. Thanks again. By the way, where is the best place to get that velcro sticky tape? I got mine from eBay! Just type in “sticky velcro on a roll” as there are lots of types and you can end up with the sew-on kind, which is no good at all for making resources! 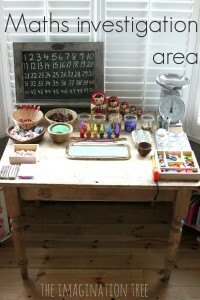 Anon, we do most of our puzzles, games and special projects in our “mummy and C.” time each afternoon while Pop sleeps! We do plenty of other activities, reading and more general games when she’s awake but anything that is going to cause distress we do alone. Hope that helps! We also do more involved activities with my oldest when the youngest is napping. Makes it much more ‘sane’ to do! Ooo even reply-to-replies! (haha how sad am I Jamie?!) I love this new commenting system! And yes, it’s the only “sane” way! I pinned this earlier today. I absolutely love the colors! 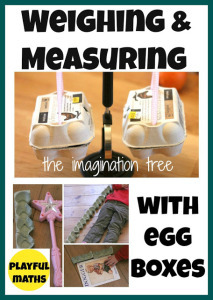 What a fun measurement idea. Thank you Krist! Especially for pinning it too! 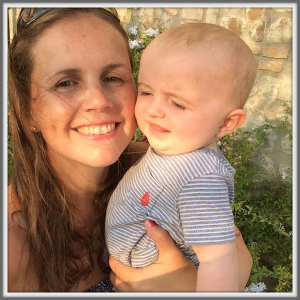 This is the best blog I have come across for realistic, imaginative and fun activities to do with my children. 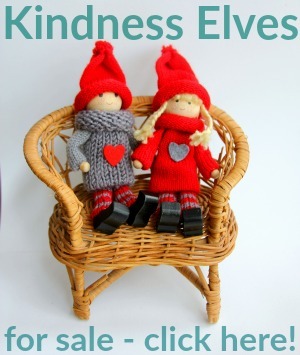 I have been pinning your photos and would love to have these wonderful ideas in a book to pick up and refer to. Would you consider creating a blurb book? I would buy it! Kathy thank you for such a WONDERFUL comment! I have no idea what a “blurb” book is but I will look it up, thanks! 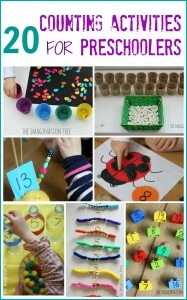 What a great idea, I love learning through play activities so will definitely be trying this one out. Thank you! And so glad that you have found us here! What a lovely idea. I am going to store this one for pre-school half term! Looks like a blast and great to get some learning while having fun!! I remember we did something similar when my daughter was younger, but we used her footprint. She was amused by measuring for quite a length of time. Reminds me that I need to try this again. Perhaps, if the handprints were covered in contact paper, they could be taken outside for measuring. here you can find the review of this post http://kpanuba.blogspot.com/2012/01/1-38.html. Thank you for interesting idea! That must be a lot of fun! You have such a lovely blog full of great ideas.